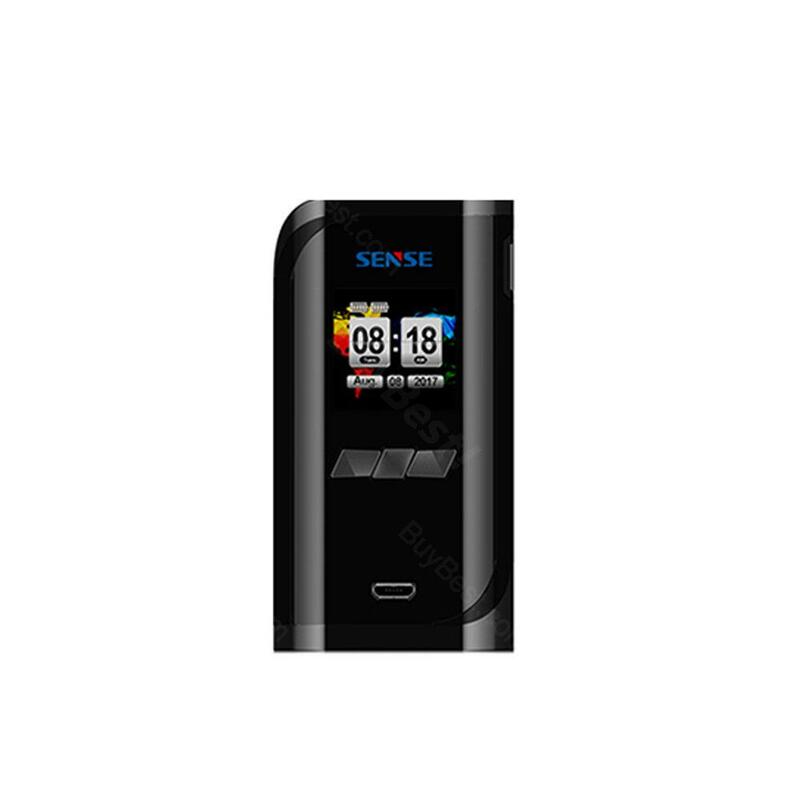 Sense V-Jet 230W TC Box MOD has a 7 to 230W output range, a 0.1 to 3.0 ohm atomizer resistance range, and several output modes, and a full colored TFT LCD screen. The V-Jet 230W TC Box MOD adopts two 18650 batteries. A fully colored TFT LCD screen displays all essential information to the user. Sense V-Jet 230W TC Box MOD has a 7 to 230W output range, a 0.1 to 3.0 ohm atomizer resistance range, and several output modes, and a full colored TFT LCD screen which gives the device much functional versatility. The V-Jet 230W TC Box MOD adopts two 18650 batteries which can be accessed via the bottom latch battery door. A fully colored TFT LCD screen displays all essential information to the user like wattage/temperature, atomizer resistance, individual battery life display, and also has a Real Time Clock (RTC) display. The V-Jet Box MOD has a four button interface, an oversized firing button, up and down wattage configuration button, and a menu function. • Mode Switch: Press the MFB(Multifunction Button) 2-3 seconds, you will enter Menu interface to choose for Mode Setting. There are VW/VT(SS,Ti,Ni)/TCR(M1, M2, M3)/TFR/BYPASS for you to choose. • Temperature Adjustment: When the temperature was set to 100℃, keep on pressing the down button, temperature will turn to 600F. When the temperature was set to 200°F, keep on pressing the down button, temperature will turn to 315℃. Quickly press the fire button 4 times can get into wattage adjust interface. Then you will see the letter "W" is flashing. The adjustable wattage is 7W to 230W. • Function Menu: Press MFB(Multifunction Button) 2-3 seconds, you will enter the function menu interface. Press up button or down button to choose the function. Press the MFB to make confirmation and go to next step. • Customization Setting:Press MFB(Multifunction Button) 2-3 seconds, you will enter the function menu interface. Press up and down button to choose the Customization Setting and press fire button to go into Customization Setting interface. Under Customization Setting, press fire up and down button to switch. • You can select V-jet Kit, V-Jet+ Tank and replacement coils in BuyBest. The mod needs to dual 18650 Battery, wish the MOD life can be longer. I appreciate the price and the MOD works well with my tank. I would like to use it everyday! 230W Sense V-Jet is powerfully and the OLED screen is big. I like it. I like the feeling in hand, and the buttons work well. Sense V-Jet TC Box MOD is a must for your vaping.